Rich in culture and diversity, Jamaica Plain prides itself on its mix of residents and sense of community. A lifestyle recreated at 45 On Burnett. Green spaces both inside and out. 45 On Burnett offers greenspaces both indoors and outdoors. The lobby features a living wall in the stairwell and a rooftop patio atop the residences. Enjoy the many parks and greenspaces just minutes from home like the Arnold Arboretum, Franklin Park Zoo, Jamaica Pond and the Southwest Corridor. 45 On Burnett is located in Jamaica Plain with close proximity to local restaurants, shops, parks and greenspaces. With easy access to downtown Boston, 45 On Burnett provides an oasis for professionals commuting to and from the city. Via the commuter rail, it’s 9 minutes to Back Bay Station and 14 minutes to South Station. On the Orange Line, it’s just 20 minutes to Downtown Crossing. You'll enjoy the best of urban living in one of Boston's greenest neighborhoods. 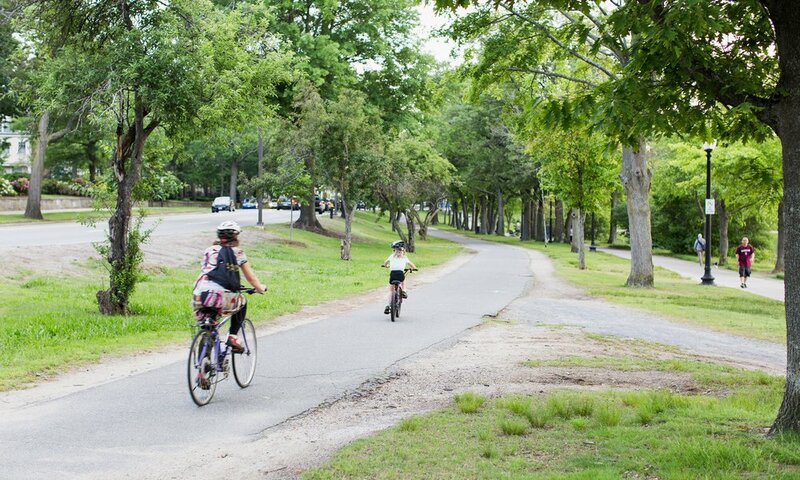 Bike along the Southwest Corridor Park, hike Arnold Arboretum's Peter's Hill, jog around Jamaica Pond or play a round of golf at historic Franklin Park. Live minutes from Back Bay, South End, the Financial District, the Seaport and all that Boston has to offer.